When the freighter Hesper was launched at Cleveland in 1890, the builders considered calling it Hesperus after a Greek mythological character. But the name was reduced to Hesper after someone remembered Longfellow’s poem The Wreck of the Hesperus, and thought the name might bring ill fortune. The steamer proved to be a good investment for the Bradley Fleet. 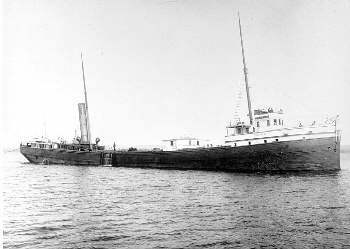 It served a relatively long and uneventful career until 1905, when it was driven ashore and wrecked in a storm on Lake Superior. The Hesper was steaming empty to pick up a cargo of iron ore at Two Rivers when it got caught in a late spring snow storm on May 3. The vessel was driven off course by winds out of the northeast clocked at 60-miles-per-hour and was hurled on a reef off Silver Bay. Captain E. H. Heaton and his crew of 15 men remained aboard for several hours until it was evident the vessel was breaking up. Eventually the crew fled by launching two lifeboats on the lea side of the wreck, successfully rowing to shore. One of the yawls capsized on the rocks, but the men survived. A fisherman later described the wreck as it went to pieces in the gale. He said the cabins and spars were torn away, then the stack fell. Next the deck was torn away and it was clear that the ship’s back was broken because the collision bulkhead was washed ashore. Eventually the hull slid off the reef into deep water. Even after that, the steamer’s tow line was still attached to the fantail deck, which floated on the surface. Another section of the deck was being held by the shrouds. Parts of the wreck were found for about five miles along the coast. Divers even today visit the remains of the Hesper, which lie in only 42 feet of water. There was one other incident involving the Hesper before that fateful disaster. 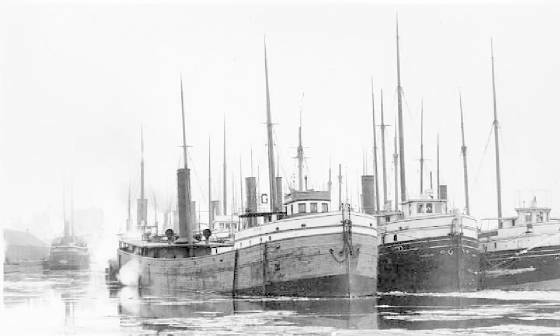 The steamer had the schooner Samuel P. Ely in tow when the Ely was lost in October, 1896, also off Two Harbors. The two vessels were traveling from Duluth. The Hesper was laden with wheat bound for Buffalo, and was bringing the Ely into Two Harbors to load ore when they ran into an autumn gale. The Hesper made it into harbor, but the crew either cut the tow rope, or it parted as they were fighting to get to shelter behind the western breakwater. The Ely dropped her anchors but they didn’t hold and the schooner was driven into the breakwater where the storm pounded it to pieces.